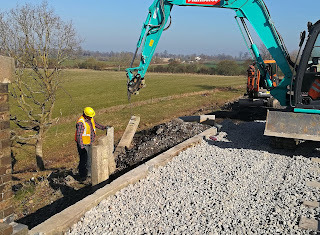 BRIDGE 12 - STANWAY VIADUCT – KING-POST GROUND STABILISATION PROJECT – work completed. Following the completion of the new King-post sleeper walls, the old sleeper walls were removed. This left the north end more or less completed, as in these two pictures. Work then started on the south end. The south end proved to be a bit more problematical because of the gabion baskets on the upside, close to which were two signal cables. 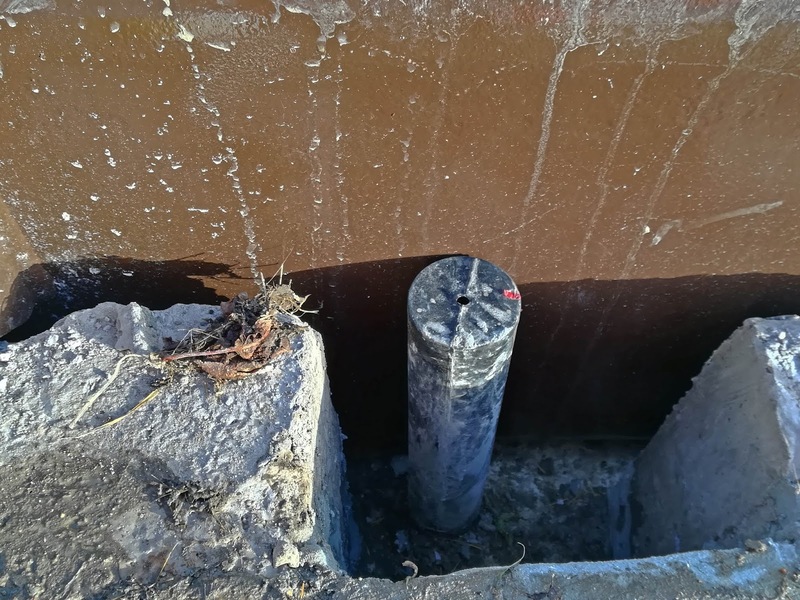 This did not leave much room to feed the 450mm diam auger between the two but it got done with slight disruption to the back of the gabion baskets. On the downside things were slightly easier. Once the steel columns were concreted in the concrete sleepers were dropped in on both sides, then the tie bar installation was started. This involved trenching between the sleepers. The tie bars are to there to anchor the tops together, which enabled a shorter length for the steel posts to be used. 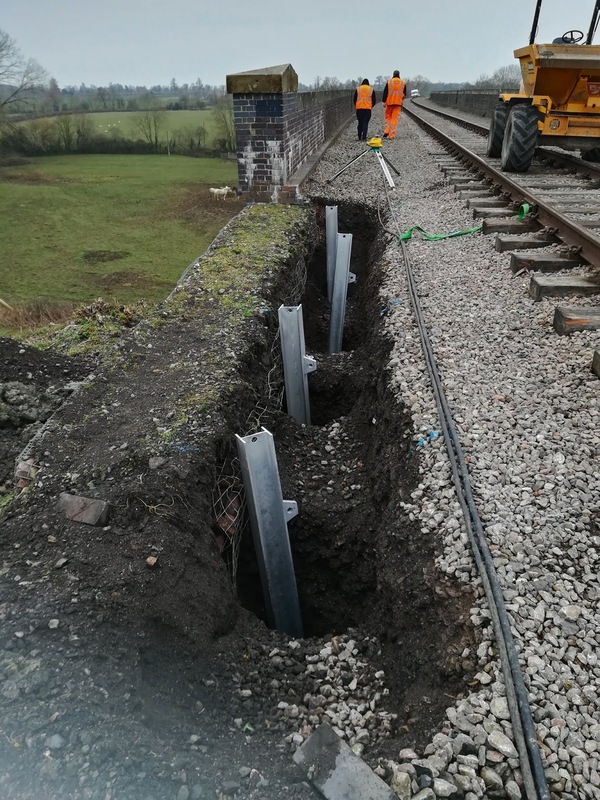 Without the tie bars the resistance to the outward movement of the track bed fill and ballast would be entirely provided by sidewards ground resistance against the concrete casings to the steel posts. To simplify the installation, the tie bars were in 3 pieces with couplings to fasten them together. One of the problems encountered in one section, was where cement grout had been mixed with the ballast to create a large concrete lump which had to be broken out to allow the trench to be dug. After the tie bars had been tightened up the side trenches were filled to restore the ballast levels back to the original and the ground outside the new walls could be regraded. At the north end, the difference between the track level and the original ground was greater, as can be seen from the step down from inside to out. There was limited scope for levelling there. The final task was to try to locate the Inspection chambers for the viaduct drainage. 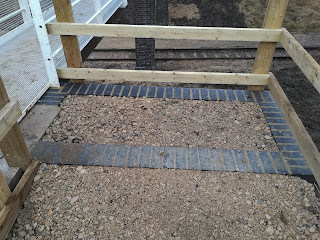 Unfortunately, by installing the track down the centre of the viaduct, they were all buried preventing any maintenance. With no real details of where they were we dug down to find one. Finally, the above two photographs show the completed stabilisation works. Photos courtesy of Alastair Watson, John Balderstone & Peter Muir. As with a few of our bridges the viaduct has a problem with ground erosion where the brick wing walls end and the embankments start. This slowly causes the track bed to become undermined. All 4 corners of the viaduct are affected to some extent, those at the north end being the worst. 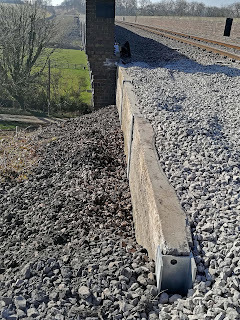 Current ballast restraint, north end of Stanway viaduct. Some years ago a retention scheme using redundant concrete sleepers was installed, but the ground movement has slowly continued, allowing the sleepers to start leaning. 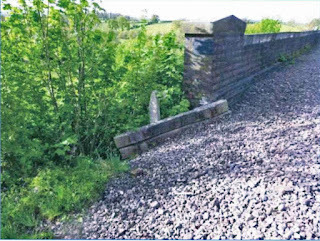 At the north end on the upside the ground of the sloping embankment is now almost 1M below the track bed level. Following a massive vegetation clearance by our clearance team, a detailed topographical survey was carried out by Surveyors, Horner’s from Evesham, to establish the existing ground profile. Then, to identify what the soil was like, a ground investigation was carried out by G.I.P. of Wolverhampton using a tripod drilling rig, and soil tests were done on the samples taken. With this information available, a scheme has been designed by consultant J. Symonds to provide a more permanent solution. 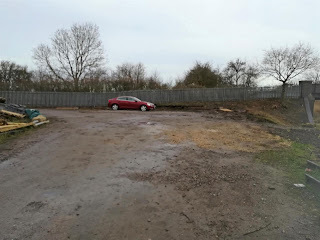 The contractors - Walsh’s of Worcester - started work on Wed. 13th Feb. The first task was to excavate a trench deep enough for the new “walls” and to make room for drilling holes for the king-posts to be installed. Next a 360 excavator with an augering tool attached drilled holes app 450mm diam. down app. 3M into the ground. Channel section attached to brickwork. 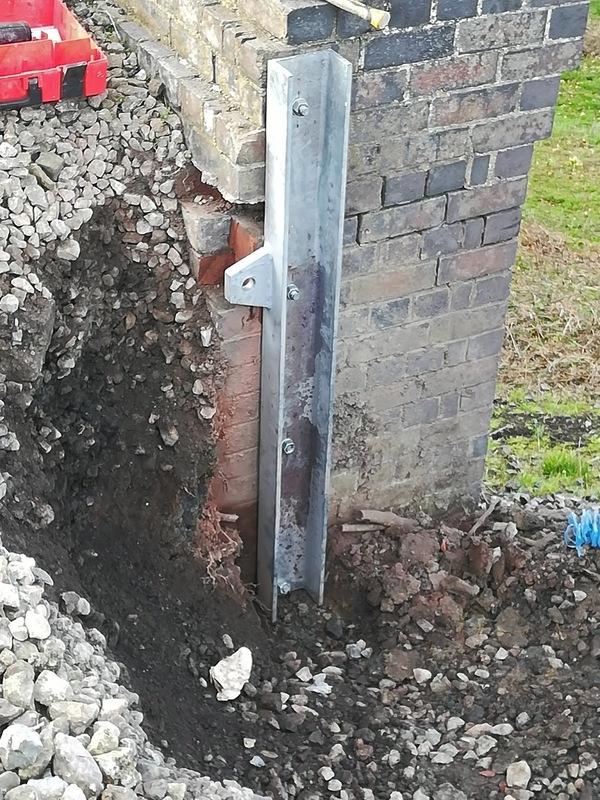 Galvanised steel columns and brackets. 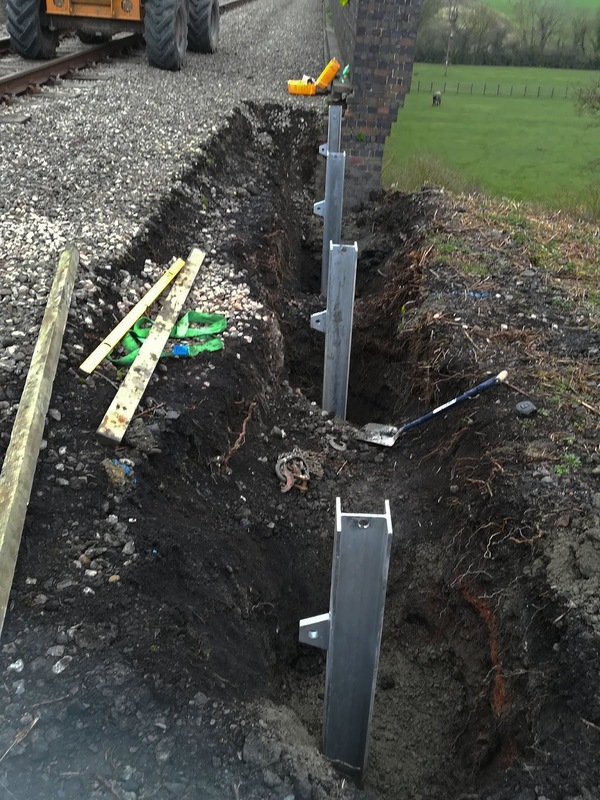 Then 152 x 152 steel column sections, with a galvanised finish, were lowered into each hole and were concreted into place. 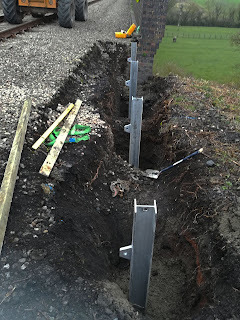 Because the ground is clay dumped from the cutting excavations it is not very well consolidated and so the tops of the king-posts will be tied together with steel bars below the track bed, using the brackets which are just visible. Where the viaduct walls end a 150 x 90 R.S. channel section is bolted to the brickwork. 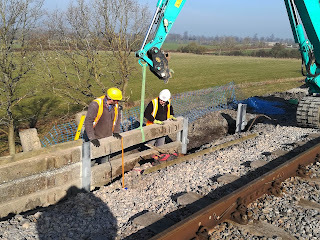 Once the concrete has hardened sufficiently concrete sleepers, which are no longer suitable for track laying, are lowered into the steel sections. The next task will be to excavate a narrow trench beneath the track bed to take the 25mm diam tie bars. Once the tie bars are in place the space between the new sleeper wall and the edge of the track bed will be filled with ballast to stabilise the edges, which were starting to be undermined. BR’s 24 (GREET TUNNEL), 43 (A435 – EVESHAM ROAD BRIDGE) & BR. 44 (HUNTING BUTTS TUNNEL) – DETAILED EXAMINATIONS. Mon. 18th to Thursday 21st Feb. incl. 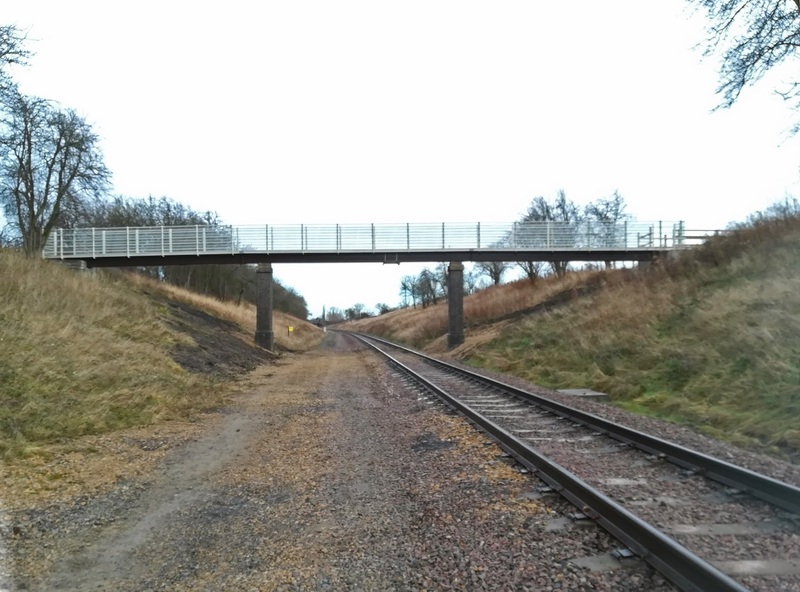 As part of our continuing bridge examination programme, these 3 structures were due for their Detailed Examination, which we aim to do at no more than 6 year intervals. This matches the time scale used by Network Rail. These are fitted around the Annual Visual Inspections currently being done by our engineer – Alastair Watson. 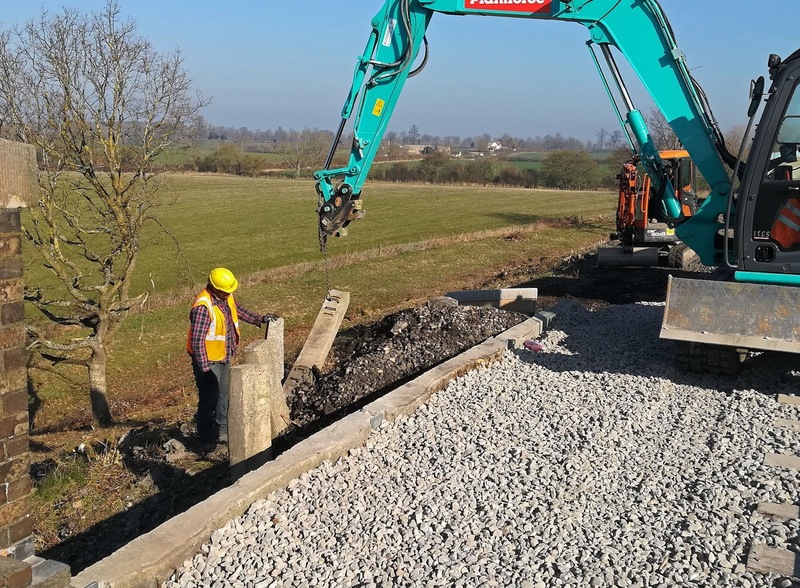 As with all our structures vegetation is a constant nuisance and a very large clearance job was organised by Mike Peers using two contractors. That work extended to the land at the south end of Hunting Butts tunnel and right down to Br. 45 (Swindon Lane), to enable a detailed examination of the south end of Hunting Butts tunnel & Br. 45 Swindon Lane to be done later in the year. Br. 24 (Greet tunnel) – Due to the size of these structures (app 7.5M to the crown of the brick arches) it is necessary to use a MEWP (Mobile Elevating Working Platform – railway name & abbreviation for a cherry picker). Unfortunately there is no road access to the tunnel and so a much more expensive Road/Rail MEWP has to be used. 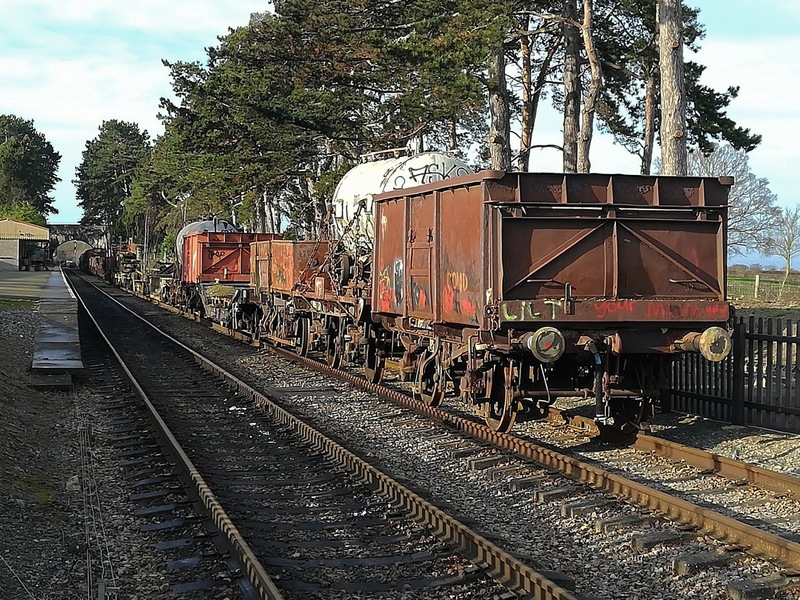 This was transferred from road to rail in Winchcombe yard, where it travelled up to the Greet tunnel. The examination work took 2 days (more photos to follow). Br. 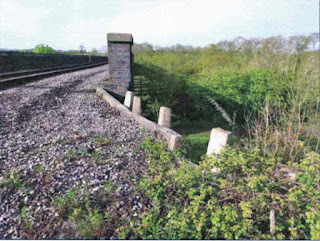 43 (A435 Evesham Road Bridge) – This is a 3-arch brick structure carrying the busy A435 road to Evesham. 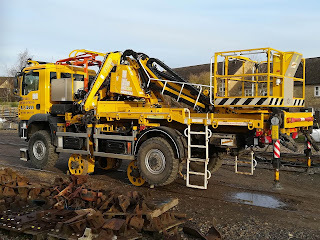 We had a choice of a Road/Rail MEWP, or an underbridge unit. A Road/Rail MEWP has some restrictions in trying to get into the two side arches and so we decided to use an underbridge unit instead. A435 half closed at Cheltenham Race Course. CRC side arch inspection with underbridge unit. This machine would be parked on top of the bridge and thread its arms wherever it could. 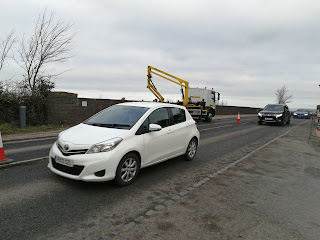 The road had to have a half closure and we had to provide traffic management. Glos. C.C. restricted us to between 9.00 a.m. and 4.00 p.m. This took just one day and more photos will follow. Br. 44 (Hunting Butts tunnel) – This tunnel has always been packed with wagons (mostly awaiting removal from the railway), since the tracks were first laid into it nearly 20 years ago. Privately owned goods wagons drawn out of the tunnel. Road/Rail MEWP on its way south through CRC station. All of these had to be dragged out and parked in P. 2 at CRC, with some from the down side shunted onto the up side, just outside the tunnel. Inspection of north portal of Hunting Butts tunnel. 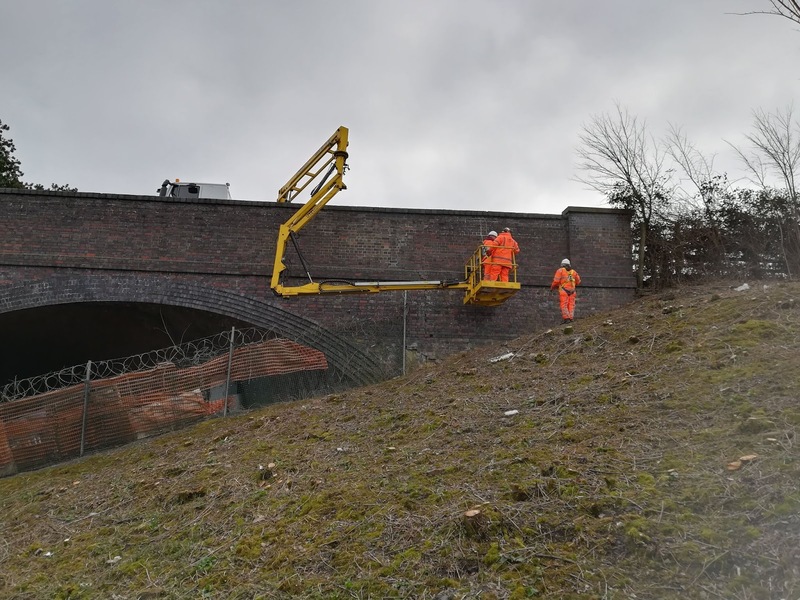 The final photograph shows the MEWP with engineers on board, inspecting the north portal. The work took just one day. Photos courtesy of Alastair Watson, John Balderstone & Jonathan Symonds. 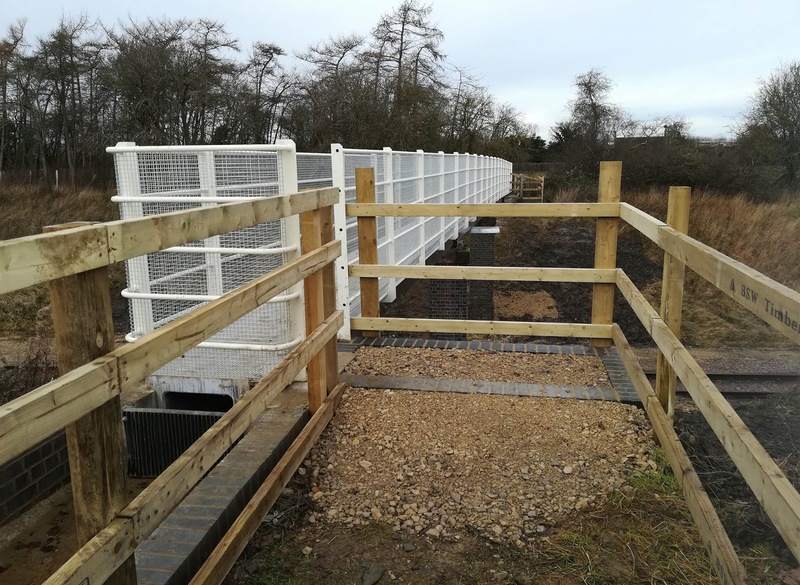 The Aqueduct/footbridge is now totally completed and the Public Footpath which it carries has now been re-opened. You can just about make out the timber fencing at each end on the south view photo. The main changes, since the last report, are to the east (Cotswold) bank seat. This has been enlarged to provide a better entrance, with a new “landing” area. All of the timber fencing around the Public footpath approach section at both ends has been replaced. The inlet on the Cotswold side has been fitted with a grating. This end is now fixed so the joint between the steel box and the concrete approach channel should no longer leak. 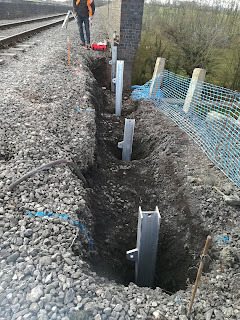 The final (not very clear) photo is of the Malvern end showing the rollers which retain the steel box but allow for movement due to expansion, which could total up to 25mm over the likely temperature range encountered in this country (minus 10 C to + 35 C). Heat absorption by the steel can add another 5C. Low temperatures slowing the off-site painting operation and some of the brick laying. 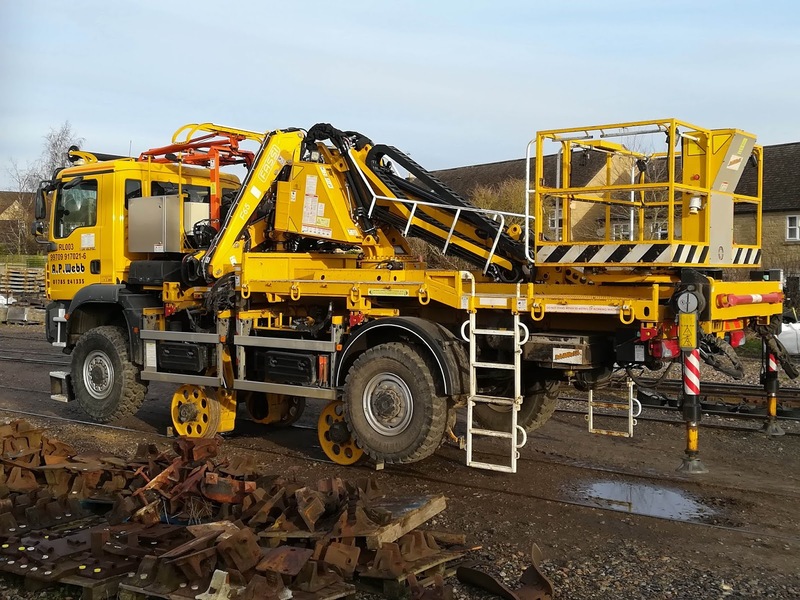 The gales, which stopped the expensive 60T crane from being used for the steel erection work. Although excellent service using a large lorry with a very long reach Hiab crane was substituted, this was nowhere near as flexible. 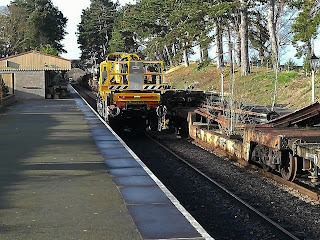 It involved some shunting of the lorry to and fro between lifts, to optimise the reach and angle needed. The short notice availability and reach issues probably added about 2 days onto the installation operation. 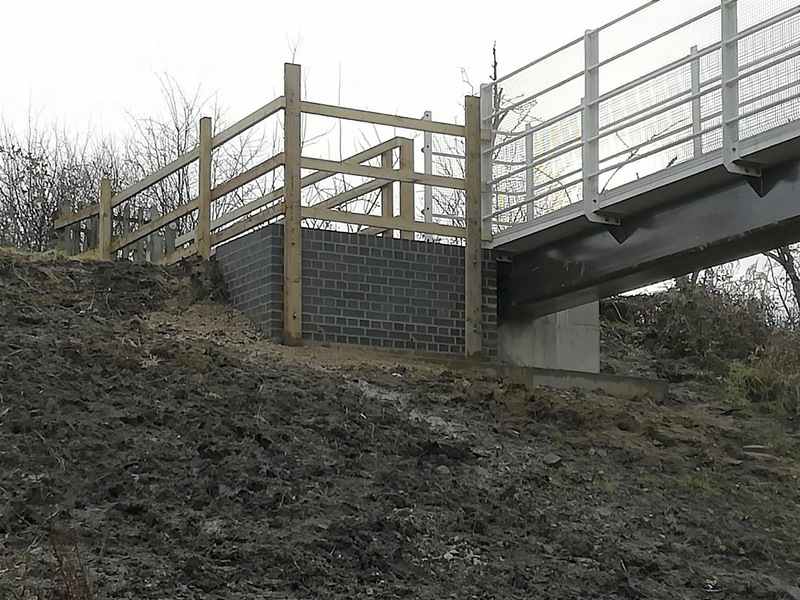 The rain, which made access up the embankment difficult and caused delays in excavation, concreting and brick laying, and the final making good. Fortunately, by very hard work and chasing around for alternatives, the Contractors were able to overcome all of these issues, and managed to get the line cleared in time for the northbound Santa trains to start on Saturday 8th December, as originally programmed. 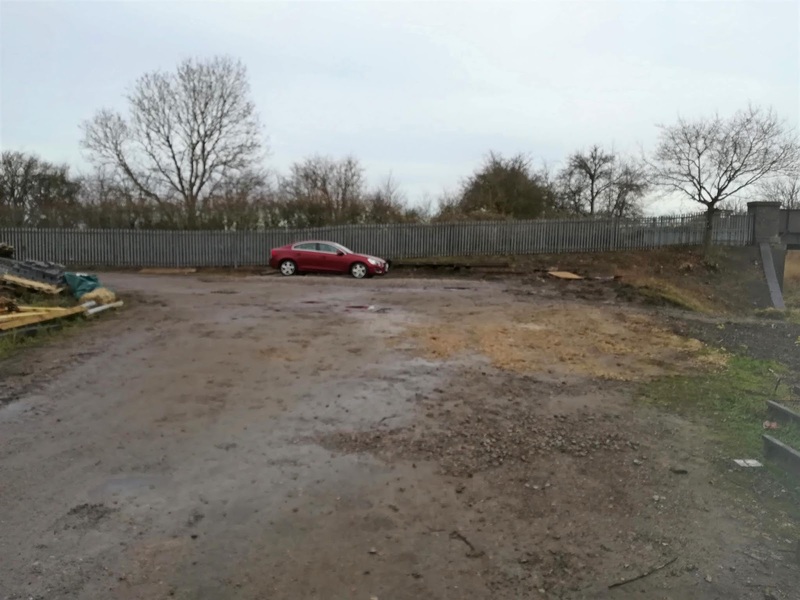 The Contractors were finished just 2 days late, on the Tuesday night (11th) and finally cleared all their welfare and storage cabins, waste skip and plant site, from Stanton yard on Friday (14th) leaving it a lot clearer than before they started (photo)! Photos courtesy of Alastair Watson & John Balderstone.